What makes a good lip balm? In my opinion, I prefer plant based, so our lip balms are all essential oil - we often get asked for various flavours that don't exist in natural form, .All of our lip balms use pure essential oils that we source ourselves to make sure they are the highest quality we can find. We're really happy to have been approved by PETA as cruelty free beauty, we do have a lip balm with beeswax in it which is the only item that isn't vegan. Probably when we finish up the Rose lip balm we'll switch it over to vegan. We also don't use any nut oils in our lip balm and as I explained to the nice lady at the fair, yes we know how wonderful almond oil is, but too many of our clients have nut allergies. 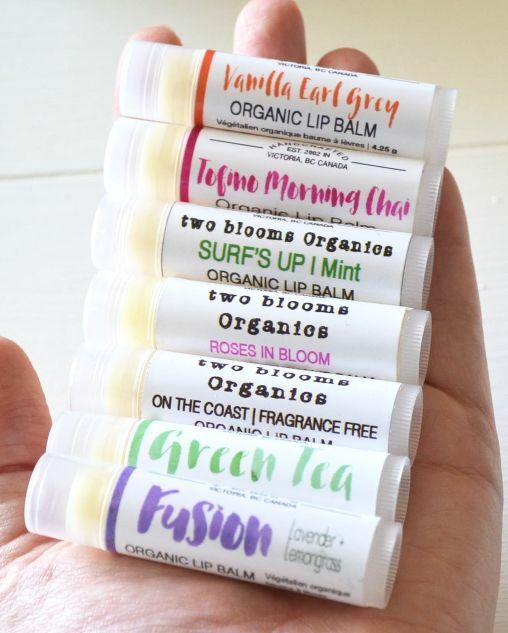 We offer choice and experience and our organic lip balms come in 7 scents. We have Green Tea (a lovely citrus blend that smells like Matcha Tea), On the Coast (an unscented lip balm and perfect for those with really dry sensitive lips), Surf's Up Mint (with a lovely cooling mint blend), Fusion (a lovely Lavender/Lemongrass melody), Roses in Bloom (with Rose Otto oil and local beeswax, this is our glossiest balm), Tofino Morning Chai (a beautiful chai blend that reminds one of sipping a Chai latte and staring at the ocean), and Vanilla Earl Grey (a lovely Vanilla and Bergamot blend that is perfect for Earl Grey afficionados. And packaging. People buy products with their eyes first, so we’ve always used tubes, different shapes and colours, but we stick with the tubes. We’re seeing lots of lip balm in pots but I personally don’t like putting my fingers in a pot of lip balm. Again, its preference – what do you prefer for lip balm, tube or pot? Caron is one of the blooms of Two Blooms Design Studio Est. 2002. She is the dreamer, self taught chef, production manager and the social media wannabe. Caron is married to the word adventure and she will never stop dreaming. I'm one of the owners of Two Blooms Design Studio and I love to write.